I Watched “The Book Thief” Movie! (Warning: Spoilers below!) | Twenties Girl! No doubt, the scriptwriters changed much of the intricacies in the book, so that they could fit the plotline into 2 hours long. Some aspects of the story’s been changed quite a bit, and may be a reason for purist fans / supporters of the book to scorn the movie, but I thought there were some pretty refreshing things added in the movie that I didn’t notice (either not present, or I didn’t catch it) in the book. This was when he presented Liesel with a Christmas present – of a book with blank pages (He had taken Hitler’s Mein Kampf and painted the pages white – haha!) for Liesel to write her own stories in it. How true, and how biblically reflective this line is – because God created everything, every living thing, by his Word. Of course, this part of the movie was also different from what was portrayed in the book – but I thought it was a beautiful alternative, nonetheless. It’s a beautiful, beautiful, story, of an incredibly lucky girl with a zest for life, and a big heart to love life, people, words, and love itself. After the bombing at Himmel Street. Everyone living on the street perished, save Liesel, who by some providential coincidence had fallen asleep in the basement that evening (and hence was saved from the crumbling debris as the brick houses collapsed). Here, Liesel was kissing her best friend Rudy Steiner (& to be boyfriend, if he hadn’t died) in desperation and hope that he would wake up from his “sleep”. In earlier times, he had repeatedly challenged her for a kiss, but was rejected time and again. To think the only time he received a kiss from Liesel was at the point of his death. NB: Interestingly, “Himmel” is German for “Heaven”, and Liesel found heaven in a her home and neighbourhood, and those who perished in the bombing went from one heaven (their earthly home), to another (their eternal home). 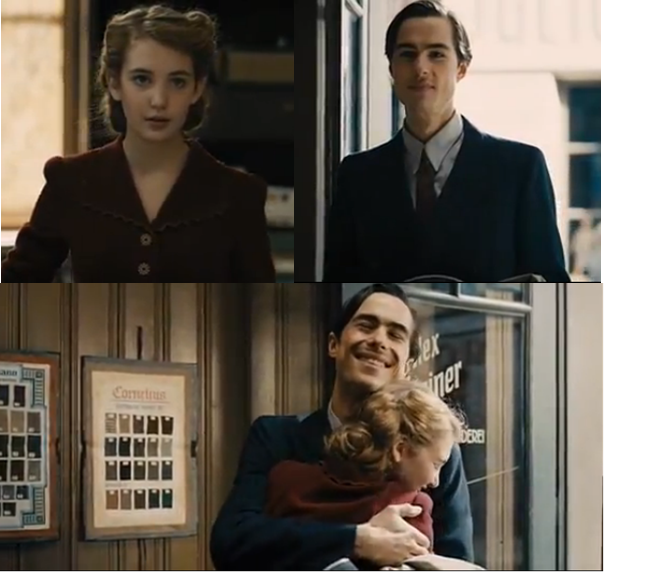 Two years later, after the War had finally ended, Liesel is working as a shop assistant in Mr Steiner’s (Rudy’s father) shop. And in steps Max Vandenburg, the Jewish refugee who had subsequently left her home to prevent the family from coming into any danger (after an unfortunate incident when Liesel’s father, Hans Huberman, was labeled to be a Jew lover). Incredibly, he had survived the war (while the rest of the Germans on Himmel street sadly did not), and traveled back to find her (them, rather). The characters portrayed in the movie were splendid. I especially loved Rudy – the boy actor played Rudy magnificently (taking the words of the author)! Oh well. Enough spoilers. Go read the book, and/or watch the movie, if you want to find out more. I’ve told you lots already, and those who hate spoilers, you will be mightily pissed with this post. Heh, sorry. I kind of love spoilers. And the pictures are so pretty. And so… My conclusion: The actors and actresses in the movie really made the story come to life. I loved almost every single actor’s portrayal of his/her character (Geoffrey Rush was brilliant as Hans Huberman, and no doubt the two teenagers who played Liesel and Rudy did so splendidly), with the exception of Rosa Huberman (Liesel’s foster mother), who seemed a lot milder, and more good looking than the book seemed to describe, and the Mayer’s wife, who seemed much more benevolent in the movie. However, the movie makes no mention of many other characters and events that took place in the book, and for me, watching the movie through “tainted” lens, I can’t help but wonder if others who have not read the book would be able to fully comprehend the significance of the story. 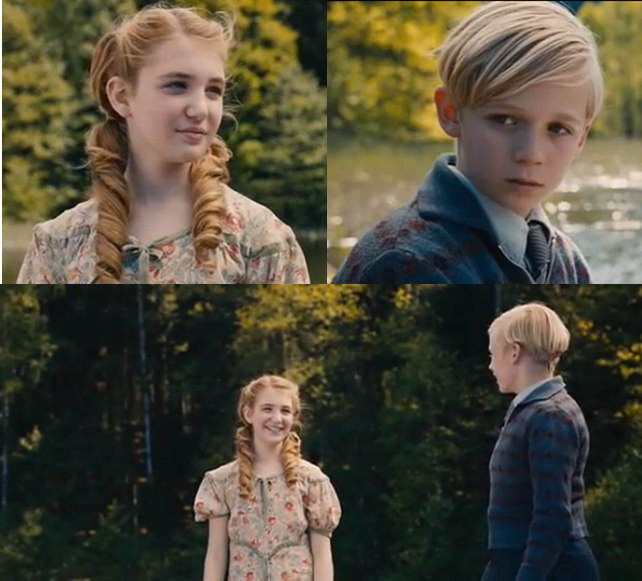 After all, the story is more than just about Liesel, it’s also about the War, it’s about Hitler’s senseless regime, about the oppression and eradication of innocent lives, and it’s also about finding hope in times of hopelessness, and about striving on, and finding reasons to smile during hardships, and about the power of the word to save your lives (and thus, the title “The Book Thief”). What did you enjoy the most? The book, or the movie?